Solid Snake doesn’t let his emotions show most of the time and for that his acquaintances are left thinking he is cold and uncaring. Add to the fact that he’s only a clone of a legendary soldier, it makes sense to think that he’s just as ruthless. But little by little, Solid Snake is shown to have compassion for his allies and has a love for life. Solid Snake’s attire is as tactical as he is, opting to wear highly advanced battle gear. He certainly looks like he means business while wearing grey and black ensemble. 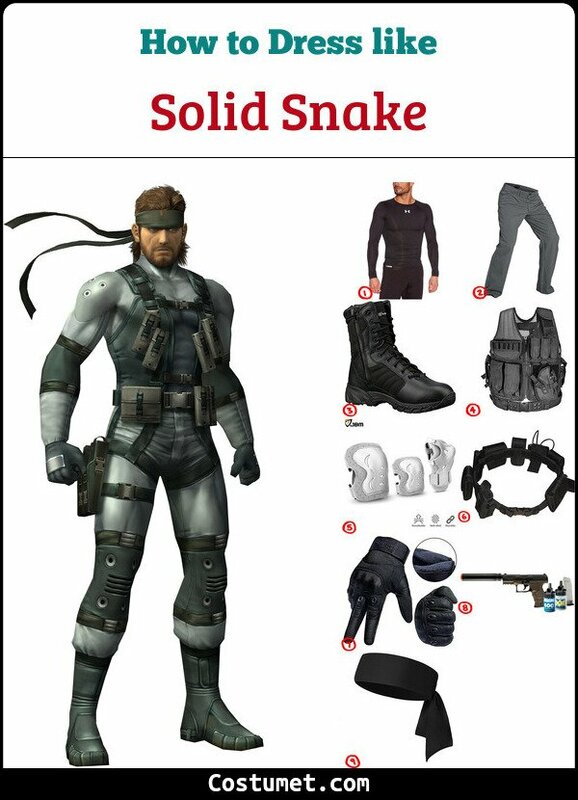 Here’s everything you need to look like Solid Snake. 1 Grey Long-Sleeved Undershirt The grey undershirt is a perfect base to stick on the various body armor details of your Solid Snake outfit. 2 Tactical Pants Another fine foundation for your costume would be matching grey pants. 3 Black Tactical Boots Solid Snake wears a sturdy pair of black tactical boots to protect his feet. 4 Black Tactical Vest When Solid Snake is out fighting, it’s important to keep protected so he wears a black tactical vest. 5 Silver Knee and Elbow Pads Pairs of silver knee and elbows pads will give Solid Snake an extra layer of protection from harm. 6 Black Utility Belt When he’s going out to battle, it’s important for Solid Snake to have pockets to store his essentials. 7 Black Tactical Gloves Fighting is hard so a pair of black tactical gloves gives Solid Snake added defense. 8 Airsoft Pistol No soldier goes to battle without a weapon and Solid Snake prefers a gun. 9 Grey Band Tie a grey band around your forehead to finish off your Solid Snake outfit. 10 Thigh Pistol Pouch To carry your weapon. Solid Snake was voiced by David Hayter throughout the whole Metal Gear series. Notably, Hayter is also the screenwriter of classic films X Men (2000) and Xmen 2 (2002).